File photo from spring game. 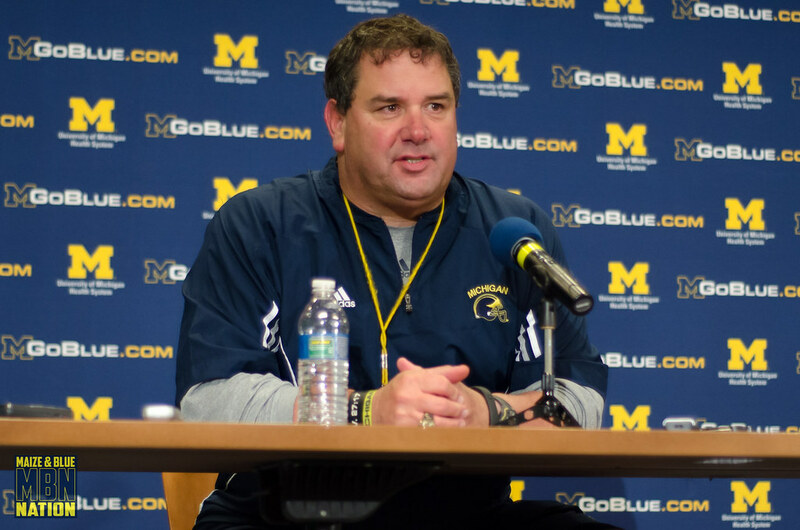 THE MODERATOR: We're joined by Brady Hoke. COACH HOKE: First off, I know we're all excited that you're all here and you took the opportunity to travel up here and it's really an honor and a privilege to represent the University of Michigan and the team 134. We've got 12 days until fall camp, look forward to it. We've had some good things throughout the summer and since we got back from the game with South Carolina a year ago. Not a year ago, but in January. We're a young team. We've got to replace some guys who have been very important to Michigan football. But with that youth comes a lot of competition, and that competition is always good. And the expectations, though, never change. And that's to win Big Ten championships. A year ago we were eight and five, and that's unacceptable. It's unacceptable at Michigan. It's unacceptable for us. And in those five losses, we had 18 turnovers. So it tells you a little something that we need to be a little more diligent in taking care of the football. We need to be a little more diligent in making better decisions. And those are things that we've talked about and we've had through spring ball, had a good spring. I like our football team. I usually don't say that. I said it after the spring. I will continue to say it because I like how they've handled themselves on the field and off the field so far this summer. I like their work ethic, and I like how they've represented Michigan in a lot of ways. Me liking them doesn't guarantee us anything, because we have a lot of work ahead of us still. And at the same time we've gotta do a job as coaches to make sure that we are doing everything capable to help our kids perform at a high level. We're excited about the season, the challenges that lay ahead. Questions now? Q. Devin Gardner took over for you in the season last year when Denard was injured and it's always been Denard's team since Devin was there. How have you seen this off season Devin take ownership of the quarterback position and be that type of leader that maybe Denard was, but just that transition to him now being the guy? COACH HOKE: Well, I think a few things. I think number one, I think he had some strong help on that side of the ball when you look at leadership. I think Taylor Lewan and the decision that he made in January spoke volumes about the University of Michigan, Michigan football. I think Devin, his maturity and understanding what it is to be the quarterback at Michigan, I think he's absorbed that, understands the decisions that we have to make as a football team and the decisions that he makes as a quarterback. They're going to be very important. Q. Can you talk about the depth that you have now on the defensive line and the offensive line and how it has evolved since you've gotten here? COACH HOKE: I think when we came in a couple of years ago, we had eight offensive linemen on scholarship. Eight or nine. And I think we've improved those numbers. I think we're at 15 right now, maybe 16. I would say the same thing a little bit with the inside people on the defensive side of the ball, because of -- style of defense had a lot to do with that. But I think our numbers are up. I think our competition throughout spring, I think the competition that -- in how they did things through summer have improved both positions, particularly the interior of the offensive line and the interior of the defensive line. Q. Denard Robinson, when he got hurt last year and you had to insert Devin Gardner at that position, did you expect that Devin would perform the way he did? And if Denard wouldn't have gotten hurt, would Devin Gardner be a wide receiver this year instead of a quarterback? COACH HOKE: No, he was always going to go back to quarterback. That was already -- him and I had talked about it. He really showed a lot of unselfishness by moving to wide receiver, and it reallybecamepartofhisDNAandwhathewanted to do to help the football team. With Denard obviously getting hurt, the opportunity for Devin to get experience and move back to quarterback meant a lot. And it meant a lot for his experience and how he learned from those things, good and bad in spring ball. Q. It seems like the trend in college football is to get more toward the spread offenses, put people in space. You're obviously going back to your pro style offense. Could you talk about that, what you like about that? COACH HOKE: I think everyone believes in a philosophy, obviously. We all have our own quirks and beliefs. But I think the physicalness that the game of football needs to be played with, I'm of the feeling that playing physical football, some pro style, and then there will be multiple enough personnel groups that I think that will be big. I think also with Devin at quarterback, you still have an opportunity to do some of the things out of the spread that may be there. But I think the physicalness that will help your defense, when you run some downhill schemes, the combination blocks. I'm an old defensive line coach, still am, and I think teaching that every day and going through that every day is something that's important. Q.What were your thoughts whenyou initially heard Michigan being compared to cancer, and what was the reaction from Grant Reed when you called him and offered him tickets to the game? COACH HOKE: Well, number one reaction is we were glad. We were excited for that young man. And being a father, our children are so important and you try and put yourself through what that family has gone through. So him beating Michigan in this context, we were all for it. But it's just something -- I'll be honest with you, it was something that we had talked about, Justin Dickens (Michigan Sports Information Director) and myself, because our kids do an awful lot in Mott Hospital, C.S. Mott. And our daughter was five months in the hospital when she was born, and so you just imagine what that family was going through. And I spoke to Grant a little bit. He's doing well. He was excited. Q. I was wondering if you shored up that backup quarterback position yet, and should Gardner go down this fall, what was the plan going forward for that? COACH HOKE: Well, we looked around to try and find maybe a guy who had graduated early and could transfer. We looked at some junior college prospects. And we just didn't feel comfortable enough. In 32 years or 33 years of coaching, I try and think how many times you've gotten to your second quarterback on the teams that you've coached. Hasn't been very many. I think Brian Cleary and obviously Shane Morris are two guys that we feel very good about. And so it would either be one of those two guys if anything would happen. Q. What is it about Devin Gardner that makes him maybe a better pro style quarterback than Denard Robinson? COACH HOKE: I think typically when people talk about pro style quarterbacks, a lot of times they talk about the heights. And they also talk about the running quarterbacks obviously is how they've performed in the gun, read zone, counter, whatever it might be. But I think Devin has a nice dual threat capability, because he probably spins the ball a little tighter. I think his height helps him over the line of scrimmage. So I think those reasons. Q. How has the bankruptcy in Detroit and the situation there affected your community and the players that are from that area? COACH HOKE: Could you ask it one more time? I didn't quite hear the beginning. Q. How has the situation in Detroit, the bankruptcy, the economic, affected your program and how your personnel that are from the Detroit area? COACH HOKE: Sure. I think that, you know, everything's a little different for every kid. Every individual, every family. It's a little bit of a different path they all have taken. Obviously we're pulling for Detroit. We're pulling for the city and the state to get together or the federal government, because it's a great town. It's a great city. For our kids, I think every situation is different, but I think all our kids, you know, maybe they haven't thought in detail enough about it. But it's all been positive. Q. Is there any change on Jake Ryan's status? Has he accelerated his return during his rehab? COACH HOKE: I think we're very excited about his progress. So I don't think anything's really changed besides he's done a great job of being very committed, very disciplined to getting himself back through the rehab and everything he's doing. We'll find out a little more as we keep going and getting closer. But I think sometime in October I think would still be a likely date for him. Q. How much importance do you put on instate recruiting? You get a lot of Detroit, Michigan guys. How much focus do you put on that? COACH HOKE: We put a lot of our efforts in the state of Michigan. That's important to us. And that's something that-- the high school coaching is very good. The caliber of the athletes we really like. And also they understand playing at the University of Michigan. So that's always a very important part for us in our recruiting. Q. Your schedule is pretty loaded up for November particularly this year. Is that a good thing for a team where you're going to bringing guys along on both lines throughout the year, especially that interior of the offensive line? COACH HOKE: The goal is, every week you have to get better if you're going to win championships. And the good teams I've been fortunate to be with, that's what they've done, from week one to week two and so on. So as far as the back end of the schedule, we've got a great schedule. And if we keep coaching and doing the things we need to do for our kids, then I think we'll be competitive and it will be a lot of fun. It's Grant Reed. The spelling is wrong. I know the family.